Tucked away, near the end of the Hebrew Scriptures (the Christian Old Testament), we find a little prophet named Haggai. Well, he could have been a big prophet, but the words we have recorded were not as many as say an Isaiah or Jeremiah or Ezekiel, or Hosea or Zechariah for that matter. His words are important, just shorter. Haggai (pronounced Hag-eye by Americans and Hag-ee-eye by Brits) was part of a post-exilic team that included at some point the main leadership of various people as Zerubbabel, Ezra, Nehemiah, Zechariah and Malachi (some overlapping with one another). 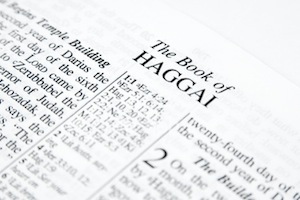 I recently found myself reading Haggai. I had no plan to, but the Lord had been speaking to my wife out of one of the minor prophets and she decided to share with me the passage. When I asked where the passage was specifically found, she mistakenly told me Haggai, though it had actually been Zephaniah (to which I later found out when I didn’t come across the passage she had read out to me). So I found myself taking up the “2 chapters” of Haggai’s prophetic message to the Jews who had returned from exile in Babylon. There are 4 points I would like to emphasise from this passage, or really 3 from this specific passage and 1 from the whole of what we know of Haggai’s ministry. I don’t know if we know this, but prophecy does not have to be long-winded. It doesn’t have to be reams and reams of paper in length (though prophecy normally comes forth first in spoken form). Prophecy can actually be quite short and to the point. And so it was quite telling for me after I read vs13 from the passage above: Then Haggai, the LORD’s messenger, gave this message of the LORD to the people: “I am with you,” declares the LORD. Simple and to the point. Nothing much else. I am thankful for the extended words of Isaiah or Ezekiel, though I believe there words did not come forth in one long exposition all at once, but rather at varying points and in varying chunks at varying times. Still, they gave forth powerful prophetic words that cut like a two-edged sword. And there words have been compiled into two large sections of the Old Testament prophets. But we can characterise Haggai’s words by the same measure right here in the little statement recorded in 1:13. Now, I do recognise that, whether Haggai or another recorded the words, vs13 probably comes to us as a shorter summary statement. And Haggai speaks forth longer prophetic messages even in his little ‘book’, i.e., see vs3-11. But we need to remember that God can speak short messages and long one’s. Neither are to be despised. Therefore, when God speaks, what we need to do is speak what He is revealing and leave it there. If He gives more, speak it. If He gives an explanation to help expound on and explain what He has given, speak it. But speak what He has given, even if it is a simple 4 words like with Haggai. I am aware that some can easily dismiss words claimed as prophecy simply because the statement is very short and to the point, i.e., ‘The Lord is with you.’ Don’t worry. Again, God can speak forth one simple word or a ream full of words. To Him, length matters not. But what is of utmost importance is that He desires to speak into the situation in which we find ourselves. Therefore, be encouraged that prophetic words can, at times, come forth in very short and pointed statements. It really is ok, at least with God. I believe this point connects in somewhat with the first. You see, I feel one area where continuationist-charismatic circles get hammered a lot with prophecy is the claim of vagueness with regards to some of the prophecies shared. Meaning, the said prophecy seems so vague and nebulous that anyone could assert such a statement, prophecy or not. And you know, such does happen. Anyone could speak forth the word, ‘I am with you,’ and claim it as prophecy, though God’s word into a particular situation is something of a different nature. But the problem exists if we fail to recognise that our friend Haggai spoke forth such a short and ‘vague’ phrase oh so long ago. And maybe there were sneers back then when his words came forth as well. But shortness and ‘vagueness’ means nothing in the bigger scheme of prophecy, lest we find ourselves discarding the words of our prophetic father, Haggai. But that argument is circular. Remember, those in Haggai’s day were not 100% certain of the prophetic nature of this man’s words. A step of faith had to be taken by the community of faith to receive his prophetic words. And they did take such a step in their particular situation. And the blessing remains to this day as God providentially saw fit to get this short and possibly ‘vague’ message into Scripture. Don’t worry if you think your prophecy is too short and too vague, at least for the taste of others. If the prophecy is 5 words in length and is in regards to God beginning a new thing in a person’s life, then speak it, and speak it with both courage and humility. It might seem to be missing some ‘meat’ or substance. No worry at all. God will bless the obedience and we will trust His word to act as the prophetic sword it is, not returning without accomplishing that for which it was sent forth. Something else that might get levelled against continuationist-charismatics is that any prophecy today would simply be a repeat of what has already been said before in the canon of Scripture’s revelation. So why would prophecy need to exist today if God has revealed and said everything He needs to say in Scripture? Come on Haggai? Why repeat a message that has already come through the prophets before? And it had come through quite a few other times as well (e.g. Isa 41:10; Jer 30:11). And I have always been intrigued by either Isaiah or Micah repeating word-for-word the same prophetic utterance. Compare Isa 2:2-4 and Mic 4:1-3. Though the passage in both cases extends a bit further on, there is definitely a repetition here. And word-for-word at that. Did Isaiah and Micah receive the exact same revelatory words, or did one apply the other’s words into their own situation? I don’t think it matters whether it was one or the other. What does matter is that the word of the Lord, the prophetic word, came forth in both instances. Different situations, different time. Not completely different and fully removed from one another. But, nonetheless, different. Yet God knew the words needed to come through in both situations. And both instances were His word into the said circumstances. Thus, to speak forth prophecy today that sounds like something already stated in Scripture does nothing to negate the prophetic nature of such words being voiced today. Matter of fact, as in Haggai’s situation, or Isaiah and Micah’s, such could underline the said prophecy. God has spoken such before, but it has come to us again, in our specific situation(s) today, to be the two-edged sword it needs to be. Repetition. It happens. A covenant God will continue to remind His covenant people of His covenant promises and revelation. It’s very much in line with the activity of our God (see the Bible). And we do forget so often and need reminders. But prophecy is not made obsolete because the canon of Scripture has been given to us by the community of faith that has gone before us. It stands just as that, a canon, a measuring stick. But God never meant an inscripturated book to replace His living word coming forth today. As Jesus said, ‘Man shall not live on bread alone, but on every word that comes from the mouth of God’ (Matt 4:4). Such is still true today. This final point here doesn’t relate to the above passage in 1:13, but rather to the whole of Haggai’s ministry. Still, I thought it would be good to bring it into the discussion while we are on the subject of Haggai and modern-day prophecy. There seems to be an unwritten rule, at least for some, that prophets must be used in signs. I am not sure where the precedence comes from, but I think it might be built from a smattering of Old Testament verses in places like Deuteronomy. And while I believe we must incorporate the Old Testament teaching on prophets and prophecy, for this is what I am looking to do here with Haggai, we also must be careful to see it as the greatest teaching on the prophetic ministry (I’ve shared before about not centering our understanding of prophecy in the Old Testament). Hence, why I am also looking to incorporate the words of Haggai into a Christ-centred, new covenant context. But, interestingly enough, when we turn to the Old Testament prophet, Haggai, we see that he was one never used in ‘signs and wonders’, i.e., in the miraculous. Moses was, Joshua was, Elijah and Elisha were, and many more were. But, at least from what we read, Haggai was not. Of course, one might want to argue that the fulfilment of Haggai’s prophecies is a ‘sign’ itself, attesting to his authority as a prophet. That is good and fine for us, now. But, again, what of Haggai’s day? I suppose there was some time of awaiting fulfilment, whether shorter or longer. And those of a more pre-tribulational, premillenial view might view his words in places like 2:9 as still yet unfulfilled even to this day. But think about the long anticipation of the fulfilment of God’s word to His people, whether directly to them or through Israel’s prophets. Sometimes it took 25 years for fulfilment (as in God’s word to Abraham in the birth of Isaac). Sometimes it took hundreds of years (as in the greater fulfilment of the prophets’ words with regards to Messiah to come). Therefore, it is not as easy as some seem to believe that, 1) a prophecy is stated, 2) it kind of gets fulfilled very quickly and 3) we have a very quick and direct authentication of the prophet. It doesn’t always happen like that. I know in my own life, I have waited a few years before prophecies spoken have come to fruition. Sometimes you wonder if the person (or yourself, if you believe God spoke something to you directly) got it right or missed it. Such is part of humans looking to walk by faith and not by sight. But the true prophetic word will be fulfilled. God is faithful to His word. But going back to the whole ‘signs’ thing with prophets. I would challenge us to be careful that we not lay out some standard by which a prophet must walk or a prophecy must be backed up. I know prophets that have been used in the miraculous today, in healings today. Yes, actual instantaneous miracles and healings. I cannot and will not deny such. Yet to espouse that these are the ‘authenticating signs’ of prophets is, well, not so easily substantiated if we are going to start from our full measuring stick known as the Bible. And I am glad our friend, Haggai, reminds us of such a reality. I am sure there is more that could be investigated in these short prophetic words of Haggai. But these were four specific points that jumped out as me as I recently read through these ancient words that still speak to us thousands of years later. And I am glad our communicative God has kept on communicating centuries after He saw fit to give us the gift that we have in Scripture. This entry was posted in Ephesians 4 ministries, God speaking, Haggai, Old Testament, prophecy, prophet and tagged Ephesians 4 ministries, God speaking, Haggai, Old Testament, prophecy, prophet. Bookmark the permalink.